Monte was born in Moose Jaw, Saskatchewan. Although his painting career was founded in London, Ontario, he presently works in a Kitchener home studio. After retirement, Monte has pursued a full-time career in art. His interests have continued to vary in scope, from monumental murals to contemporary, abstract art and digitally generated images. His art has been shown in many countries including New York, Florida, Italy, England, and Argentina. 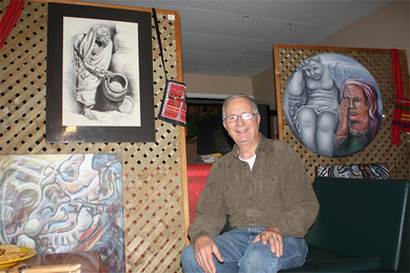 Monte has shown his work in many private and public galleries. Monte is a mixed media artist. Over the years, he has moved closer to simpler, expressionistic work. Subject matter is secondary to the exploration of line, space and texture. Basic colours and fluid movement are of prime importance throughout the canvas. Monte has also been exploring a series of work called 'Behind the Mask'. He believes that we sometimes wear masks to hide our true thoughts and feelings. Boldly-coloured, canvas paintings of masked figures examine our role in the workplace and universe as well as global issues. He studies romantic, symbiotic collages that magically transport us to a changed existence. The issues of power, love and control are exposed in his compositions and a spiritual relationship is revealed. " 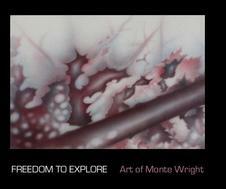 Monte believes the important thing is that an artist must never stop exploring regardless of one's age."